Camp Coconuts is "Simply the Most Fun a Kid Can Have This Summer"! 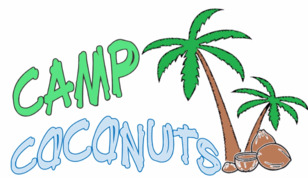 Camp Coconuts is a summer day camp located in the heart of Middletown, NJ. With one indoor pool and three outdoor pools, state of the art ice-rink, martial arts studio, fitness studio, beach volley ball court, wall ball court, gaga pit, playground, baseball diamond, basketball court, soccer field, arts & crafts studio and 8.5 acres for all outdoor sports. Each week campers will enjoy versatile and exciting programming which includes: swim lessons, free swim, ice-skating lessons, ice-skating, martial arts, archery (ages 9+), drama, music, Glee, dance, free play, kickball, soccer, field hockey, basketball, arts and crafts, volleyball, nukem, gaga, low ropes activities, Flying Squirrel, team building activities, exciting excursions, theme days, and much more! Did we forget to mention that campers will be participating in these activities several times a week! Camp Coconuts is committed to creating a wonderful summer experience for its campers. We focus on helping children develop relationships that will last a lifetime in a fun, inviting, and supportive environment where kids can become more physically fit, mentally focused and confident. It is through laughter, play and exercise that Camp Coconuts helps campers achieve success! Everything included in one low price so don’t waste any time, secure your spot today! Check out our summers of fun from previous years on the Camp Coconuts Facebook page and CampCoconuts.com! Want to get in touch with us? Email us coachd@campcoconuts.com at or give us a call at (732) 856-9473!